If you’ve ever felt lonely, know that you’re not alone. According to a study from the British Red Cross, over nine million adults in the U.K. feel the same way—that’s about 1/5 of the country’s population! Loneliness is increasingly being considered a hazard to human health comparable to obesity and smoking. Now, even governments are getting involved—in 2018, the U.K. appointed a Loneliness Minister, Tracey Crouch, to help combat the country’s chronic loneliness problem. In the U.S., loneliness is labeled an epidemic worthy of a public health intervention, but there hasn’t been any major government action yet. So why exactly is loneliness such a big problem? Feelings of loneliness affect everyone at some point, but persistent loneliness can become a serious problem that damages physical health and shortens lifespan. The term epidemic is usually stamped on infectious diseases that spread across populations, but loneliness is currently impacting people in similar numbers to many public health concerns. For instance the U.K. recorded 435,000 diagnosed cases of sexually transmitted infections (about 0.65% of the population) in 2015, which is a lot less than the 1/5 of the population experiencing loneliness! Despite the number of people affected by loneliness, there currently aren’t many ways to diagnose, prevent, or treat it. This is partly because loneliness is hard to measure. Measuring loneliness is not as simple as measuring blood pressure, taking an X-ray, or testing for an infection. Instead, loneliness encompasses many factors—some measurable and some not. Figure 1: The basics of social network sizing. An average network has several close ties that are often in contact and many acquaintances that add substance to the network. 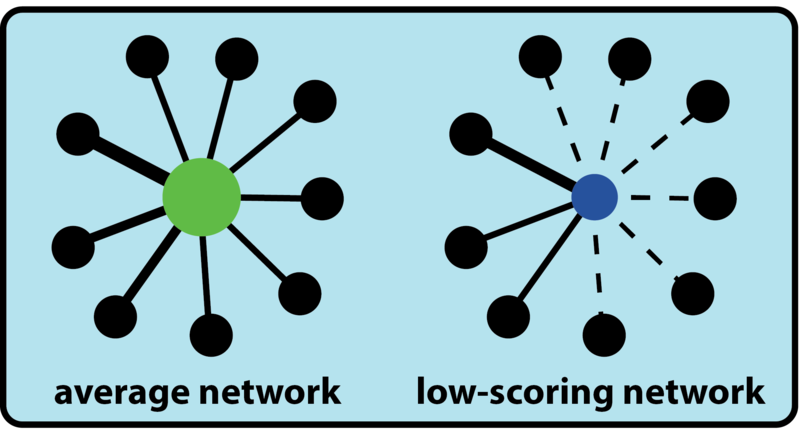 A low scoring network has more weak or absent ties that lack qualities like mutual confiding or reciprocal interest. Researchers use several kinds of data to determine whether a person is lonely or not. Aspects of someone’s life, like marital status, size of household, and size of social network (Figure 1) all have a hand in establishing who is more likely to identify as lonely, but much of these data come from surveys and statistical analyses. Researchers rely upon these techniques to investigate variables like perception of loneliness, perceived support, and satisfaction in relationships—the things that are harder to quantify with numbers. It’s important to note that surveys often have biased results that researchers need to account for in their analysis. Bias typically occurs when the people surveyed don’t accurately represent the whole population, so it’s important to either collect a wide range of data or speak more specifically to a smaller population. Self-reported data can also contain inaccuracies because people have a hard time explaining or quantifying how they’re actually feeling, even if they want to provide an honest response. Specific survey questions can enlighten researchers with hints about social networks and their influence on feeling lonely. For example, a government research survey asked older people in the U.K. how long it had been since their last conversation with a friend or relative: 200,000 adults said it had been more than a month. Survey responses help to quantify the extent of people’s ability to connect socially from the way they responded. It’s important to note that social isolation and loneliness are used often used interchangeably in daily conversations, but they technically refer to different states of being. Isolation can refer to someone with few relationships or infrequent contact with others, while loneliness is the perception of feeling disconnected. Therefore, it’s important to include how people feel when collecting data. How does loneliness affect our bodies? In an article in the Harvard Business Review, Dr. Vivek H. Murthy, former Surgeon General of the United States, wrote, “Loneliness and weak social connections are associated with a reduction in lifespan similar to that caused by smoking 15 cigarettes a day and even greater than that associated with obesity.” Why is loneliness so harmful to our health? While loneliness is not linked to any single disease, it is a risk factor for a wide array of illnesses and causes of death (Figure 2). 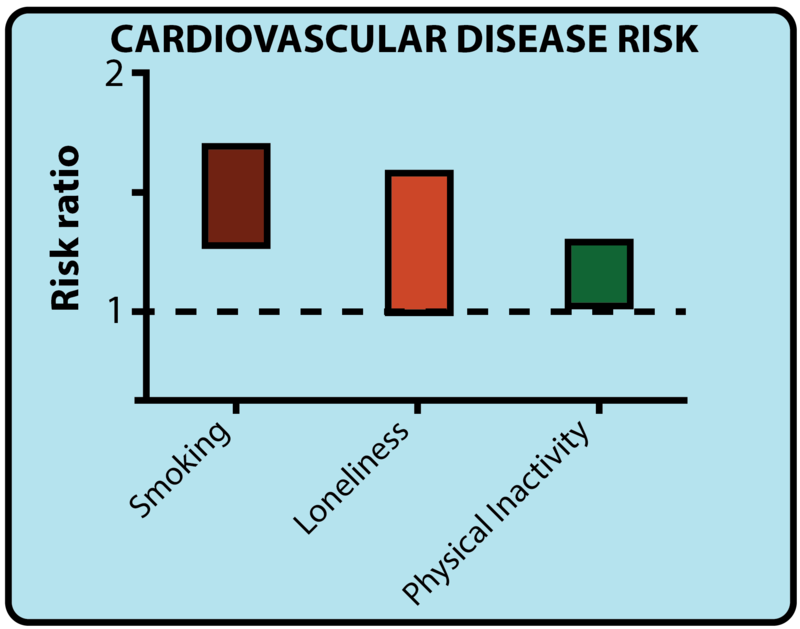 Figure 2: Loneliness as a risk factor for coronary heart disease and stroke. One study looked at cardiovascular disease and included loneliness as a risk factor alongside more recognized factors like smoking. Deficiencies in social relationships were found to increase the risk of developing coronary heart disease and stroke by ~30%. When separated from others, humans find themselves in a psychological stress state some might refer to as “fight or flight.” Being around other people provides safety and security that stifles this stress state and decreases the perception of loneliness. When alone, or feeling alone, humans subconsciously sense that they must be more aware of threats in the environment, so the body prepares to deal with them via a stress response. Stress triggers a cascade of hormones that orchestrate physiological changes in the body. Most people have experienced a racing heart, muscle tension, or quickness of breath because of stress, all of which prepare us to fight a threat. The body, however, can’t always discern a real threat from an approaching work deadline or, say, feelings of loneliness. Furthermore, repeatedly activating the stress response takes a physical toll, and issues can arise when the body is chronically in that state (Figure 3). One study acknowledged that elderly individuals, who are already experiencing decline in immune function, are more likely to identify as lonely. Older people are more vulnerable to immune challenges and are more susceptible to infections and disease. Social isolation and loneliness, therefore, could further compromise the immune functions of an already immunocompromised population. The body can only handle high levels of stress for so long, regardless of age. And if stress batters the immune system early in life, it could take an even more significant toll on the immune system later. Figure 3: Chronic stress influences health over time. The body is trained to respond appropriately to stress, but in large amounts, it has detrimental effects for the body. 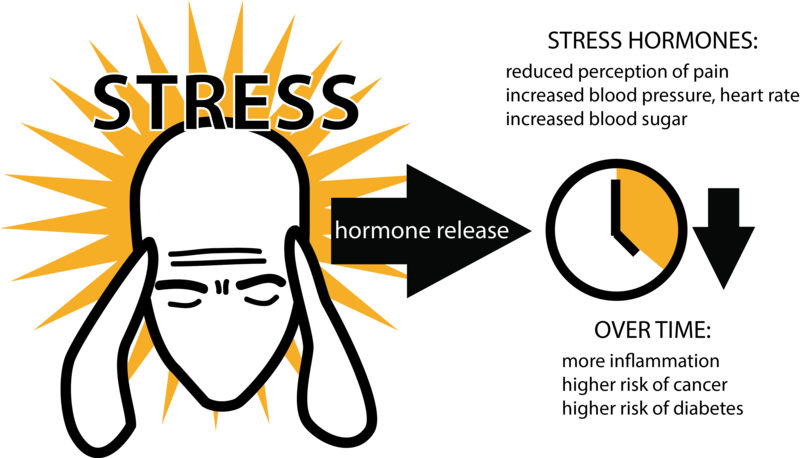 Stress hormones cause changes, like increasing the blood pressure, to respond appropriately to the stressor. If the effects linger longer than required for the response, more serious diseases can develop. Regarding specific diseases, stress leads to higher levels of inflammation and higher risk for cancer, cardiovascular disease, and diabetes. This combination may explain the increase in mortality associated with loneliness and why studying the immune system’s response to stress could illuminate how loneliness contributes to so many different diseases. As mentioned above, researchers are comparing the effects on mortality of being lonely with those of obesity and heavy smoking. Research also connects loneliness and accelerated cognitive decline. Overall, these results indicate that the stress caused by loneliness affects more than emotional health—it also influences physical health. While the solution to the loneliness epidemic is multifaceted, encouraging people to build meaningful, mutually beneficial connections is a step in the right direction. Research on social media interactions has shown that loneliness is more pervasive in societies and age groups where social media usage is the highest. Different kinds of social media influence loneliness more than others. For example, text-based social media (like Twitter) is more highly associated with loneliness than photo-based social media (like Instagram). But we can’t just blame social media for damaging our relationships. Dr. Jacqueline Olds, a psychiatrist in private practice and a staffer at Massachusetts General Hospital and McLean Hospital, wrote a book on taking the important first step of talking about loneliness as a society—out loud, not online. The U.K. and U.S. governments are following suit by promoting initiatives that are focused on awareness and openness to get people talking. Theresa May, the Prime Minister of the U.K., implemented the first big intervention—appointing a ministerial lead on loneliness focused on building community. A study by the American Journal of Public Health determined loneliness is associated with higher healthcare utilization among older adults, but healthcare workers are not trained to consider loneliness alongside other illnesses. Such studies suggest that the first step might be training physicians to consider loneliness as a factor while seeing all kinds of patients, not just those identified as high-risk. With solutions just beginning to emerge, more research is needed to determine which fixes produce a more connected, less lonely society. Initial research is already pushing public-health and policy officials to prioritize social engagement factors like loneliness alongside their existing warnings about smoking, diet, and physical activity that we see all the time. Making connection a priority builds communities that are less burdened by loneliness and are generally more resilient. Do yourself a favor and call a friend today. Hannah is finishing a Bachelor of Science in Biomedical Engineering from Wentworth Institute of Technology and hopes to find work at the intersection between social consciousness and engineering. Hannah frequently participates in community events and loves being outside when the New England weather cooperates. Just wanted to drop a line to say thank you for this. Currently researching the impact of loneliness within the United Kingdom for an exam in January 2019, and come across your article which I found to be unbiased and informative; a lot of the statistics I had read previously and it was nice to see that this area of concern is being reported from across the globe which can only help raise awareness in the long term. I will certainly be citing this for my bibliography. Yes, I believe there is loneliness. They should be a campaign to promote a awareness.many people feels loneliness but they are not aware. Previous Previous post: You Asked: What’s the deal with gluten?